Wanted to get the best quad-core smartphone deal today? We have pitted the recently released Cherry Mobile Flare Lite 2 Bundle and the popular Smart MyPhone My28 bundle. Cherry Mobile outs the Flare Lite 2 bundle for only Php 799. This is by far the most affordable quad-core smartphone offering after the heavily lauded MyPhone my28 and Smart bundle. The 799 Flare Bundle includes a 4-inch Android smatphone and Cherry Mobile Prepaid SIM card which also comes with exciting freebies. 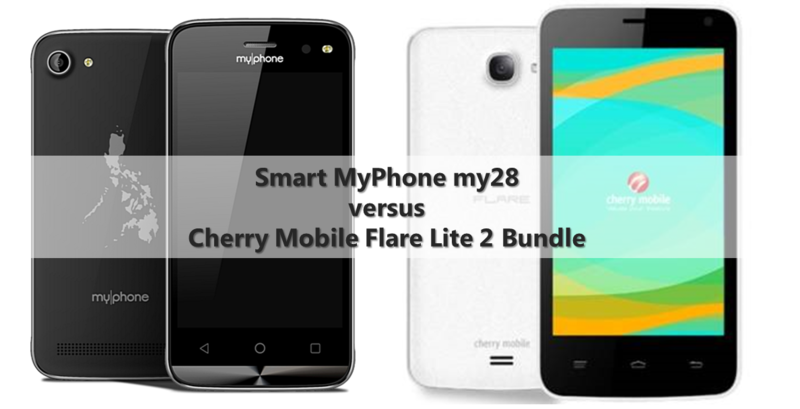 Of course, there’s an imminent battle between MyPhone my28 and Flare Lite 2 bundles; and we’re here to guide you spot the better deal between the two. Since we have already covered the my28, we give the spotlight now to the Cherry Mobile Flare Lite 2. The handset is basically the second iteration of the popular Flare Lite handset. Just like the former, it also packs a 4-inch WVGA display, 512MB of RAM and a 1.2GHz quad-core CPU. For price comparison's sake, the Cherry Mobile Flare Lite 2 is cheaper(Php 799 versus my28's Php 888); however, in terms of hardware, the my28 comes with better feature set. MyPhone my28 battery is a tad bigger (1450 mAh versus 1400 mAh of Lite 2). Likewise, it also comes with larger on-board memory (8GB vs 4GB of Lite 2). While both have the same 5MP shooter, the my28 features a 2MP front facing camera, the CM Flare Lite 2 only has 0.3MP VGA shooter. Another noteworthy difference is the fact that the MyPhone-built handset boots with Android 5.1 Lollipop while the Flare Lite 2 is powered by an older Android OS (Android Kitkat v4.4.2). The Cherry Mobile Flare Lite 2 bundle is powered by Cherry Mobile SIM which technically operates with Globe. On the other hand, MyPhone My28 partners with Smart Communications. The former offers 120MB of data per month for 12 months. However, you need to top-up atleast Php 10 per month to enjoy the service. The My28 only packs with 100 MB per month for 12 months. This means that the Flare Lite bundle has bigger data allocation. When it comes to freebies, the my28 is better than the Flare Lite 2. It comes with unlimited Twitter, Facebook and Viber for a week; while the latter only packs unlimited Facebook for two days. The my28 is also bundled with two-day unlimited texts to all networks; Lite 2 only has 50 texts to all networks for 2 days. The price conscious buyers might prefer the Cherry Mobile Flare Lite 2. It comes with bigger data allocation for mobile connectivity; as well as Php 10 bonus load every month. For the specs-initiated users, they could opt for the my28 which features a newer version of Android, bigger battery, larger on-board memory and front-facing camera. There’s also a generous rebate system and one-week unli FB, Twitter and Viber. Both handsets are great deals for those trying the waters of the smartphone market.